Rogers’ Chocolates was established in 1885 by Charles Rogers’ of Victoria BC and is known throughout the world as one of the Premiere Chocolates. In January 2003, Roger’s embarked on a program that would assure greater natural ingredient components, no preservatives and doing away with hydrogenated oils. 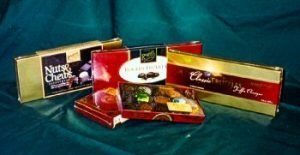 For the last 127 years Rogers’ Chocolates continues to produce and hand wrap gourmet chocolates with a notable flavour while honoring time-endured traditions. Rogers’ Chocolates are often selected over renowned Belgian and North American producers for its appearance, texture, smell, and taste. The original shop in Victoria BC remains as the home of Rogers’ Chocolates. Rogers’ notes such celebrated customers as the White House, Buckingham Palace, Shania Twain, Alfred Sung, Madonna, Adam Sandler, and Michael Bolton.